"Grandma's too sick to come to Israel for Passover" My mother's voice crackled on the line like an echo on a distant mountain. I remember sitting at my computer with the phone in my hand staring at the blank, gray screen in stunned silence. "Can you hear me? Are you there?" It took me another minute to speak as all my lofty plans of hosting my whole family for Passover began to crumble into tiny, irretrievable pieces. The first tears began to weave their way down my cheeks "Okay, I'm going to work on getting tickets to NY," I heard myself say. And soon after that I found myself packing suitcases in the playroom as the first tears began to weave their way down my cheeks. It wasn't that I was sad about going to America for Passover; I was worried about my grandmother. 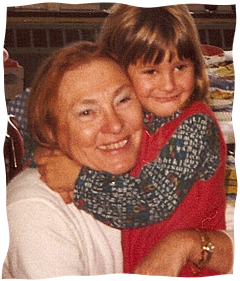 Since my earliest memories, Grandma had always been one of the strongest people that I knew. She would wake before dawn to walk the track or swim laps in the pool after she prayed from her turquoise siddur with the gold letters. She had reddish golden hair and beautiful clothes. When I was little, Grandma would sometimes pick me up from school in her white Firebird sports car and when anyone in front of her drove too slow she would yell out: "Move it, Buster!" But the memories that stand out the clearest in my mind are the ones from our family Seders. When I was really little, Grandma still used to make the Seders at her house with her gleaming white china stretching across the long table from the dining room into the living room. I still remember my grandfathers and great-grandfather singing together as my mother, my aunt, my grandmother and my great-grandmother prepared each platter in the kitchen with their own song of laughing banter. I remember falling asleep in the living room as the meal began; I remember feeling safe and loved and free. When I grew older my Mom began to make the Seders at our home, and our own silver and china shone in the light of the dining room chandelier. But my grandmother and great grandmother could still be found laughing in the kitchen as my grandfathers sang and the grandchildren ran down to the basement to search for the afikoman. A few years later I was able to stay up later, and I began to notice that my grandmother was one of the only family members who lasted until the end of the Seder- singing and glowing with a special light. I remember how she laughed when she sang "Dayenu"And then as a teenager I got it! Grandma loved Passover! She loved making the Seder plate and setting a royal table. She loved the Hagaddah and all the songs within it. I remember how she laughed when she sang "Dayenu"; that was a song that embodied Grandma's spirit of life. Everything was enough. Everything was beautiful. Her own journey from the Lower East Side to Westchester was a "Dayenu" story. Her struggle to raise a Jewish family in an increasingly secular society was its own victory. My soul drank from my grandmother's prayers. The Seder became a symbol of freedom for me, too. It was a lifeline in University as I struggled to remember who I was and where I came from. It was an oasis of peace when I first married and heard my husband's lovely voice singing the songs of my great grandfather. But that bittersweet year as I prepared toys and snacks for a long plane ride, the Seder became something else for me. It became an involuntary good-bye to my grandmother who had shaped my heart and breathed love into my prayers. It became a struggle to feel free in my own world of grief and despair. It became a test; could I say good-bye and still sing? By the time the plane took off my three children had finished all my carefully prepared snacks, and they had opened every toy. An hour into the flight I found myself covered in Cheerios with two sleeping toddlers on my lap. It was March and in New York, it was snowing. The glaring, white blanket wrapped me in its blindness. I was grateful for its chilly anonymity. Grandma was weaker, but she was still herself. My Mom was in the middle of an arduous campaign for re-election to the NY Supreme Court. On the evening Passover began, a reporter came to take campaign photos of the family as my husband desperately tried to make the kitchen kosher for Passover. The camera man actually took a picture of my husband emptying boiling hot water onto the kitchen table; in retrospect, it was definitely a Kodak moment. The girls were in their Seder dresses for the newspaper pictures long before noon, but we had to bribe them with lollipops to smile for the pictures. They were jet lagged and confused. But my grandmother was beaming with joy. When we finally began the Seder I had to stop myself a few times from crying. I could tell Grandma wouldn't make it to the end of the Seder this year even if her great grandchildren danced and sang around the table. But when "Dayenu" came Grandma sang, and I listened to each word. And I heard what I already knew I should know. Every second, every minute, every day, every year is enough. The time and the opportunities that we are given are exactly what we need. But when Grandma got up before the end of the Seder, I ran upstairs and cried. Who will give me strength now? Who will inspire me? When the plane landed at Ben Gurion my heart lurched. How could I stay here when my beloved Grandma was dying in New York? How could I go back to my home in the mountains of Jerusalem when my own mother needed me? But the beauty and joy of our last Seder followed me home and gave me courage. I looked at my children and saw the future. I stood in front of the Western Wall and felt my grandmother's arms. A few months later my grandmother called and asked me to come home to say good-bye. When I sat by my grandmother's side as she passed from this world to the next world, I heard the faintest of echoes of those beloved words: "Dayenu. It is enough. It has always been enough. Everything that You give me is more than enough. I am finally free." Sara Debbie Gutfreund lives with her husband and children in Waterbury, Connecticut. She holds a B.A. in English from the University of Pennsylvania, and a Masters in Family Therapy from the University of North Texas. Beautiful story. My late husband never had a real family Seder. treasure the memories of our Seder table growing in size and our six children plus guests. The most memorable was the newly arrived Russian immigrants. I had Russian haggadas. Of course dinner isn't until after reading the Haggadah. Our Lubavich tradition is to open the front door for the arrival of Eliyahu the prophet. Our guests went with us and since our family couldn't speak Russian, we were surprised when our guests took their coats from the closet and said,",Dosvedanye!" which is ,"Goodbye! " We quickly led them back to the table. I remember their tears at the words "We were slaves!" and they pointed to their family. They never had a Jewish wedding. I arranged with Chabad. Grandma's last Seder. When the book comes out, Please tell me the name I think I'd like to purchase a copy to cry with as this is what this did to me. To see stone cry, truth.